The number of places that you can turn to online to learn anything that you might ever want to learn continues growing. 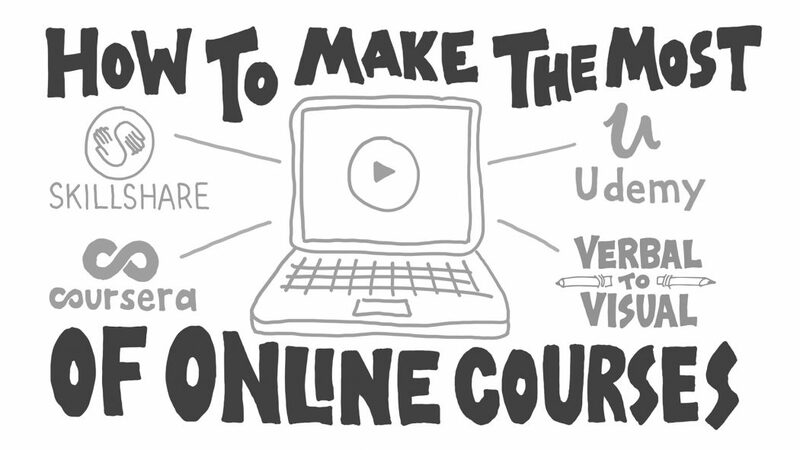 Via platforms like Skillshare, and Coursera, and Udemy there is no shortage of online courses. With that said, the mere existence of online courses and the decision to sign up for one does not necessarily mean that you’re going to get a whole lot out of it. 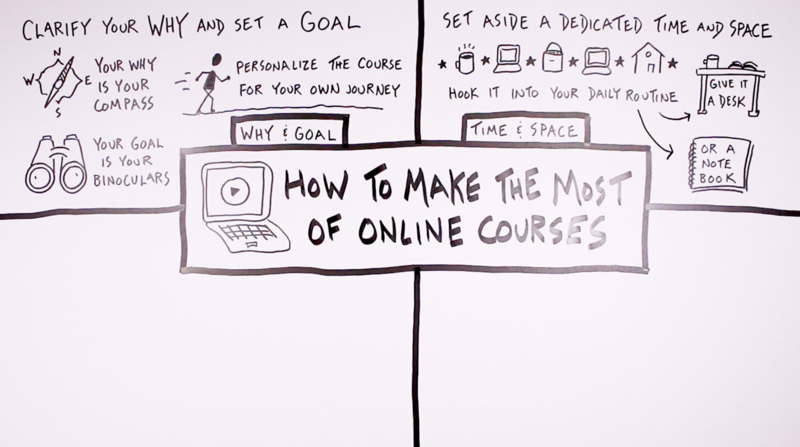 In this post I would like to share some tips for how you can make the most of whatever online courses you choose to sign up for (including my own, if sketchnoting is a skill that you’re interested in learning). I’ve got four distinct tips to share today, so let’s jump right into the first one. I think it’s worth identifying two things up front, before you even start digging into whatever course you just signed up for. Start by clarifying your why and setting a goal. Those two things might sound similar, but in my mind they’re actually distinct. Think of your why as your compass. It’s a foundational part of who you are, what you’re all about, and where you’re going in life. It is the thing that helps you continually move in a direction that’s right for you. Start by clarifying why you’re taking the course and set a specific goal that you’d like to reach by the end of it. 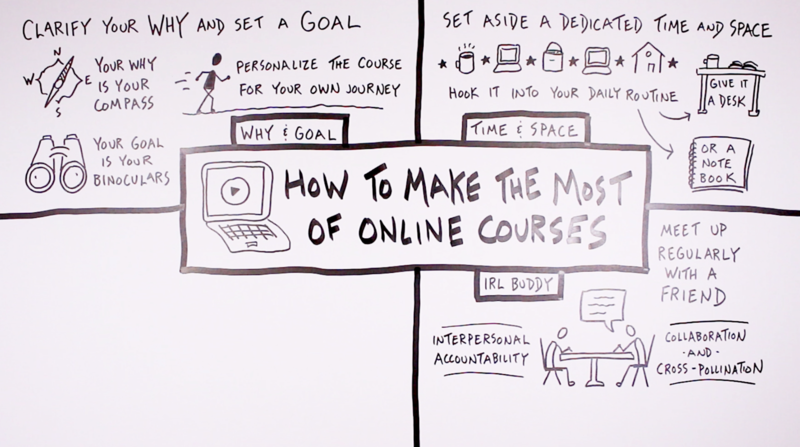 So within the context of online learning, you want to make sure to define for yourself why it is you chose to sign up for the particular course that you’re about to take on. Why do you want to learn whatever skill that course is teaching? We’re talking about a deeper level why, not a surface level one. So if your first response is something like “Well, it will make me better at my job,” then you need to go deeper. Why will it make you better at your job? In what way? And why is that even important to you? Spend at least a few minutes digging a few layers of why deep until you feel like you have a good understanding of why it is that learning this particular thing is important to you. Express your why concisely. That becomes your compass. That why is intentionally a little bit deep and might be somewhat long term, which is why we balance it with a goal. Think of your goal as your binoculars. A goal is something that’s a bit more concrete–something that you can see in the distance and work your way toward. Your goal, then, is the specific thing that you would like to get out of the current course that you’re taking. Depending on how the course is structured, chances are there’s already some sort of a goal built into it. But the goal of the instructor may or may not align completely with yours. So don’t be afraid to set your own goal that is specific to you and that aligns with your why. That will give you something specific to work toward as you’re working through the course. In this way, by first defining your why and then setting a specific goal, what you’re doing is personalizing the course so that it fits for you and your journey, recognizing that your journey is in some ways unique from everyone else that happens to take that same course. By adding those personalized touches, you’re going to make it more likely that you’ll get something useful out of the course. You’ll have a personal investment in it from the get go, which will help provide some momentum along the way. Speaking of momentum, that ties well into tip number two. In order to build and maintain some momentum as you work through an online course (with the assumption that you’re probably working through it on your own) you’ll want to set aside a dedicated time and space within which you focus on working through the course materials. If you don’t set aside a dedicated time and space, it’s too likely that you’ll forget to make regular progress on it, especially since it’s a digital thing. You don’t necessarily have a book on your shelf that you’ll see regularly that will remind you of the thing you’re trying to learn. But if you intentionally set aside some time and some physical space, then you’re much more likely to actually dig into the course materials and make progress regularly. To help you make regular progress, set aside a dedicated time and space to work through the course materials. My suggestion is to hook that time and space into your daily routine, the routine that already exists. That probably starts with some breakfast (and maybe some coffee), then you likely jump into work (whatever work looks like for you), maybe taking a lunch break in the office or outside of it, then you go back to work in the afternoon, and ultimately you end at home. Build it into the flow of your day. Try to identify where within the flow of your day it makes the most sense to spend some time on the online course that you signed up for. It might be best to do it right after breakfast and before you head into work. Maybe on your lunch break is a good time. Or maybe in the evening once you’ve put the kids to bed. That will help remove some of the startup energy that’s required to actually get going with that learning. Give it a physical location. Another piece that will help remove that startup energy is if you have a specific physical location that’s dedicated to whatever it is you’re learning, a location where you do that learning. Maybe that looks like giving the course a desk where you print out whatever resources are part of the course and set those down, alongside a pen that you like and a mug that you know is good for coffee in the morning or tea in the afternoon. That plays a similar role to a book that you might leave out on your desk that you’ve been meaning to read. It’s a physical reminder of the learning that you intend to do, and the fact that you’ve given it that space makes it easier to jump into that learning. If you’re not always in the same place when taking in that online course material, the physical location could be a single notebook where you keep track of all of your notes from that course. That notebook could be something that you take to different rooms within your house or office, or what you throw in a backpack when you’re headed to the local coffee shop. You probably already know yourself well enough to know which of those two types of options might work best for you: a permanent physical space like a desk, or a more portable space like a notebook. By setting aside a dedicated time and space, you’re moving the chips a little bit more in your favor, making it more likely to build some momentum with your learning and maintain it over time. The third thing that I think can be helpful when taking online courses is to meet up regularly (in person) with a friend. I want to point out here that internet friends are important too and can be just as real (we’ll get into that in the next tip), but I do think there’s something unique that comes from being in the same physical space as another human being. Set up a recurring in-person meeting with a friend to share your progress and chat about the work (even if you’re working on different things). I myself have found it very helpful to have a recurring weekly co-working session with my friend Austin who you’ve seen in a handful of Verbal to Visual videos. That weekly co-working session plays a couple of roles in my life. On the one hand, there’s a level of interpersonal accountability. I have another person that I can check in with every week and share what progress I made since the last week. Even just knowing that I’m going to have another person to talk to, to check in with about the particular project that I’m working on, that makes it much more likely that I’ll actually make the progress that I want to make. That accountability is more powerful than when I’m just relying on goals that I set and declare to myself. What those co-working sessions also allow for is collaboration and a cross-pollination of ideas, and you don’t even have to be working through the same course or on the same type of progress as the other person that you’re meeting up with. In fact, I think there are a lot of benefits when each of you to are working on your own thing because you’ll find that interesting parallels occur, and something that they’re doing might spark an idea with your project. That’s the type of energy that you get by having a face-to-face conversation about what you’re working on. Through that cross-pollination of ideas, you might even hit upon a particular project that you might like to collaborate on together. You can bring your skills, they can bring theirs, and what you create together is bigger and better than anything that each of you could have built on your own. So, for all of those reasons, I do think it’s worthwhile to try to set up a regular meeting with someone that you know, in real life, face-to-face, because not only will that help you stay accountable to the goals that you set for yourself, it will also spark new ideas and help you work through problems more efficiently than if you only did your learning on your own. As helpful as those in-person connections are, I do think there is also a whole lot of value in documenting and publishing what you’re learning online. That relatively simple act of sharing what you’re learning is the whole reason that this project here, Verbal to Visual, even exists. Before I started this platform where I teach the skill of visual note-taking and share ways that skill can be used, I started a blog called The Graphic Recorder where I simply shared every sketchnote that I took and the things that I was doing to improve my own skills. Considering documenting and sharing bits of what you learn online to create an archive of your learning, to connect with a global community, and to sow the seeds for a future creative career. By sharing that journey on a blog and connecting with others via platforms like Facebook, Twitter, Instagram, and YouTube, what that was doing was getting some helpful feedback loops in place. Set up helpful feedback loops. Those feedback loops helped me to learn more efficiently because other folks were there cheering me along and suggesting a new author that I should read or another website to check out or a YouTuber that I should follow. Knowing that those people were out there, and wanting to be a part of that community by supporting others as well, became a way of tapping into those same two benefits of accountability and cross-pollination of ideas that we talked about in the last section. Create a record of your learning. On top of that, it also resulted in this really cool record of my learning and of the stages of my own development. It’s an archive that I can look back on to see how far I’ve come and to remind myself of lessons that I may have learned but forgotten. In hindsight, I can also see that I was sowing the seeds of a creative career that I decided to foster and help bloom, using the tools of the internet to support that creative career. By approaching your sharing from the perspective of a learner, you’re taking off a ton pressure. You don’t have to present yourself as an expert or someone who has mastered the skill. By documenting what you’re up to, reflecting on it, sharing it with others, and having conversations with others, you will amplify whatever it is that you learn and take away from a particular online course. So rather than just binge-watching a bunch of videos one weekend that you forget the next, you’ll actually be putting into practice what you’re learning and building a strong foundation for continuing to use those skills in the future. If you do all four of the tips I’ve outlined here, you’ll be in really good shape. 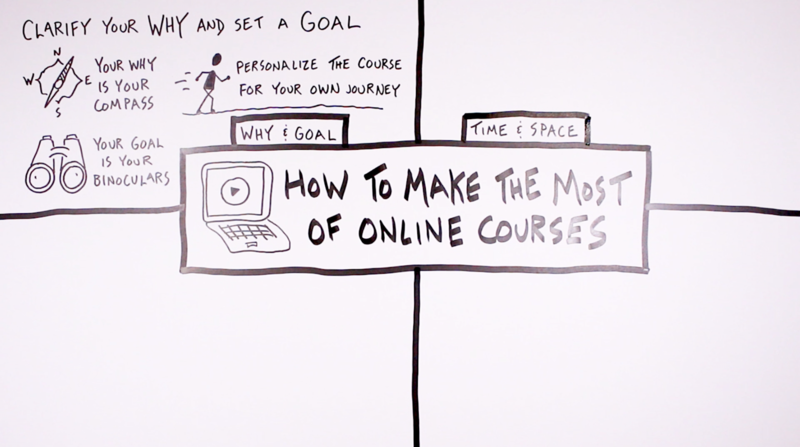 Start by clarifying why you’re taking the course and setting a specific goal to work toward. Then make sure to set aside a dedicated time and space to make progress on that course. Try also to meet up with a friend or two (maybe every week, maybe ever month) to check in on how it’s going and share progress with each other, even if you’re taking different courses and working on different projects. And spend a bit of time documenting what you’re learning and sharing that in an online format so that others can participate as you create a record of what you’re learning and where you’re going. There is so much to learn and so little time, so you might as well make the most of what you’ve got. 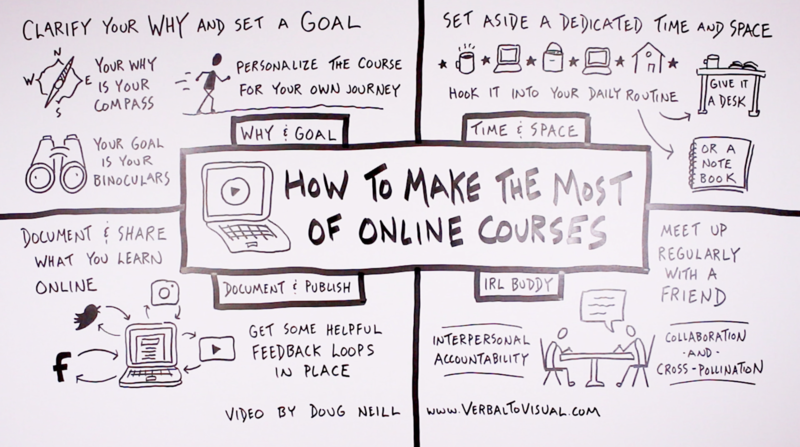 I hope these ideas help you to do that, and I encourage you to apply them to any online courses that you take. I started learning the skill of sketchnoting because I saw it as a very powerful learning tool, something that I’d be able to apply to the online courses that I was taking, along with the books I was reading and podcasts I was listening to. And it just so happens that it’s a pretty good problem-solving and storytelling tool as well. 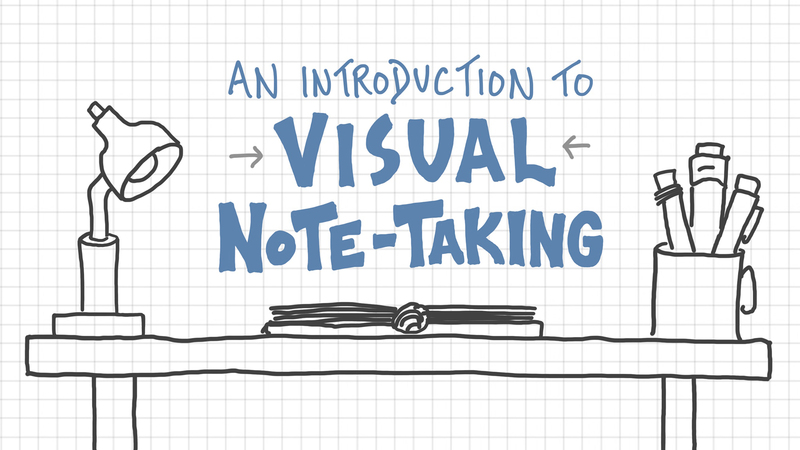 So there’s my little pitch for adding “sketchnotes” to the list of skills you interested in developing. More than anything, though, I hope that you enjoy whatever it is you choose to dig into next, and that you’re able to apply what you learn online to your life in a meaningful way.